Okaasan to Issho – (おかあさんといっしょ) | personal.amy-wong.com - A Blog by Amy Wong. 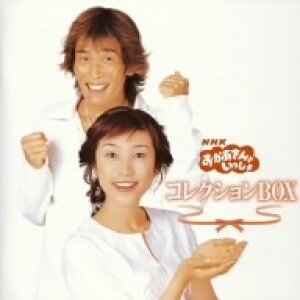 When my family first got cable, I remember watching NHK. Now, as a person who doesn’t speak Japanese at all, and being a Japanese wannabe… the only programs I could actually follow sans subtitles were kid shows. One of them is the long-lasting Okaasan to Issho, which apparently began showing on October 5h, 1959. I think the first time I saw the show was in 1999… or I could be wrong and be 1998. 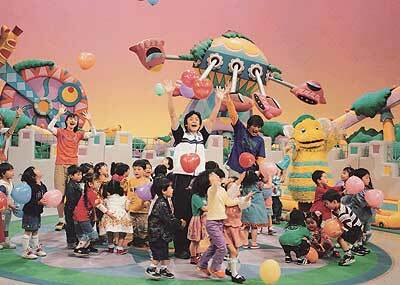 Anyway, if you don’t know about it… it’s like hmm, Menudo meets Sesame Street, but for really really small kids. I’m guessing 2-3 years old. The show has been inventing and re-inventing itself throughout the years. Changing life-size-puppets, and hosts in their many years. Since I began watching in the late 90’s, I’ve seen 2 different sets of life-size-puppets. And I think I’ve seen my fare rotation of hosts… including the first set of 4 hosts, and 2 hosts in this last week. The first set I’m talking about is the Do Re Mi Fa Nattsu Do! puppets, which included 2 French poodles (I’m guessing siblings), a gorilla and what I think it was a badger. By that time, there were what I supposed were the regular hosts, as I had no idea this show had been so long on the air. Two guys, and two girls… a pair did the gymnastics, and the other pair the songs. Then my mom called the main puppet who happens to be yellow, a bee… but it’s a very weird bee, methinks. His name is Supu… and then one more weird boy animal being named Jacoby, and another girl named Anemu. 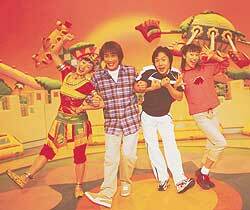 The BIZARRE beings came along to create the skit of Gu~Chokorantan. Gymnastics Girl: Itou Mayu (not sure about the name, aka Miho Itou) *EDIT* Just found a gymnastic segment online featuring Itou Mayu. For detailed information, I suggest going to the unofficial fanclub… though it’s all in Japanese. Google Translate works okay. Loads of information there. Yes, i recognise the singing and gymnastic people. I got to know this show through my toddler son who enjoys so much.Unfortunately i am not able to sing those songs for him. If there are some good souls, who can translate those lyrics for me to pronoun those song lyrics. It be great! Sorry, just pronunciation. No translation. 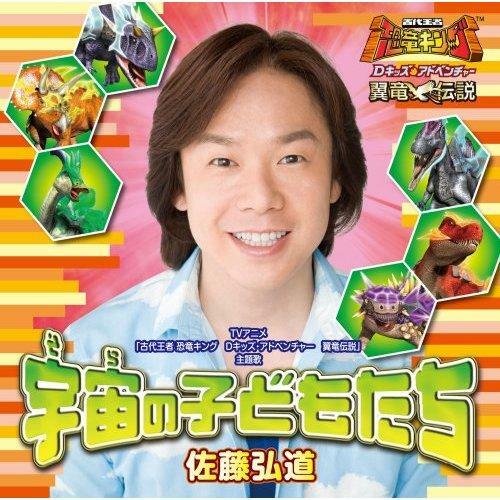 I’m trying to figure out which songs on Okaasan were Brazilian songs. I’ve been hearing these Brazilian (mostly kids) songs lately that I recognize even though the words are in Portuguese, not Japanese. 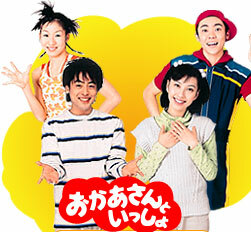 We’ve watch Okaasan off and on since the 90s. This is a great article! Thanks so much for writing about this show: I’ve been curious about it for years. Today I finally decided to look it up (I’ve got the TV Japan premium channel on cable). Your post answers a ton of questions I’d accumulated over the years. There is one unanswered question that drives me crazy, though: what, exactly, are the three costumed characters supposed to be, animal-wise? I read in Wiki that they’re supposed to be the children of weather gods, but that doesn’t really help. One appears to be a goat, another a female cat– but that third: is he a badger? Dog? Any help would be appreciated and would let my OCD-mind quit trying to figure it out! The Weather Gods from the MONORAN MONORAN モノランモノラン sequence — I think their names were Raigo (Thunder), Suirin (Water/Rain), and PUUTO (Wind – I hate his name xD) — they were changed a few weeks after the Tohoku Earthquake. I don’t think they were supposed to be shaped as any animal, though. The other three characters you’re referring to aren’t weather gods. They’re from the new segment POKOPOTEITO ポコポッテイト. MUTEKichi seems to be indeed a badger, MINYA is a Munchkin cat, and MEKOBU is actually a Jacob sheep. Is MUTEKichi a badger or a tanuki? Sometimes tanuki are referred to as badgers. I can’t quite place what MUTEKichi looks like, so I’m not basing that question on looks, just on what I know about tanuki and their prevalence in Japanese culture and folklore; it just seems more likely that a children’s character would be a tanuki. 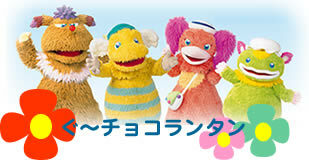 I’m not that familiar with the stuffed characters from the show, even though I have seen them over and over and over; we watch it for the music and dance. In my younger son’s long long childhood (he has special needs), many of the songs from this show have remained among his all time favorites. Some of the songs on this show have got to be among the all-time best songs ever created for children. Wow- thanks for the information! WRT the animal characters, that makes sense: regular black-and-white badger (thought he might have been a skunk, but the tail was wrong). They really chose random, obscure animals for the other two, though: munchkin cat? Jacob sheep? Wow- wonder how they were chosen? I grew up seeing the Japanese kids magazines at various places in San Jose and had always thought the different sets of animals were completely different shows (the poodles, the monsters, etc.). You’ve cleared up a mystery I didn’t even know was there. Zannen, I downloaded the videos 4 years ago, now they delete all the videos! How can I watch them again? Do you know? hi! can you email me the video please! I used to watch these when I was 4-6 years old. I attended kingdergarden in Japan when my father was studying there. Misa this show! my email; – (it’s an icloud email, yes it’s weird). Many thanks!! The fourth animal from “Do Re Mi Fa Do-Nattsu!” isn’t a badger. It’s a tree kangaroo! For “Poko Potteito”, the animal choices are not related to whether or not they are found in Japan. 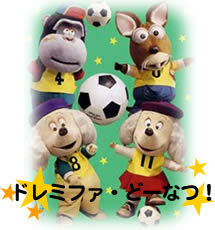 The characters’ personalities are supposed to be similar to the characteristics of the animals. Mutekichi: has the honey badger’s fighting spirit, courage, and never-give-up attitude. Miinya: has the competitive spirit and physical prowess of a cat (Mutekichi mixes up her kind name, Manchikan neko, with Tonchinkan neko, meaning “Crazy Cat”). Meekobu: has the tradition, prestige, patience, and calmness of a Jacob sheep. Wow, I didn’t know tree kangaroos existed! Thanks for all that info. hey, can you send me the video aswell? Im having a hard tiem trying to find them on the internet.